iPhone Girl - a new nameless Chinese celebrity! iPhone girl is a new Chinese celebrity, but as with Second Brother on the Right, no-one knows iPhone girl's actual name. iPhone girl has hit the headlines after a user named markm49uk posted photos of her to the MacRumors forum. 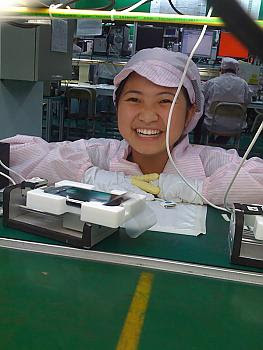 After buying an iPhone and activating iTunes markm49uk found that the 'home screen (the screen you can personalise with a photo) already had a photo set against it' showing images of the iPhone girl in the Chinese iPhone factory. 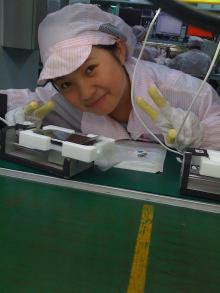 Since this post the iPhone girl story has been picked up by mainstream news and China.Org.Cn have traced iPhone girl to the Foxconn factory in Shenzhen, South China near the border with Hong Kong. The iPhone girl story is yet another example of how through the internet a small event (an iPhone purchase in Hull) can turn into a global news story.